The banner for this issue of Aesthethika reproduces a detail of M.C. 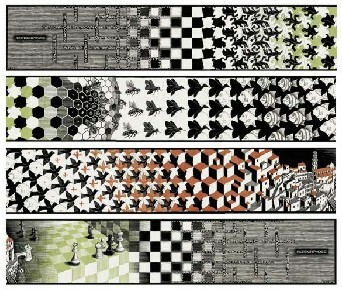 Escher’s work, “Metamorphosis II”. This wood engraving made in 1940, like most of his work, suggests aesthetic shifting between sensory experience and the conventional world. In the “situational cross-section” that we selected, one can see a battlefield rendered by a chess board on the right of the image. The black pieces have just check-mated, sacrificing their Queen. If the white pieces play the rook, stalemate their king allowing the opposition’s horse to give the final blow. The scene represents the culminating moment of the battle. It has been a prolonged combat with many casualties on both sides. Despite the more powerful White army –notice their Queen and two rooks – it reveals its Achilles heel and must surrender the throne. What does Escher tell us with this journey? That the formalization and shifts in thinking are a reflection of decisions based on practical experience. And that certain choices, including that of ceding the Queen in the chess analogy, anticipate –as in the movie Casablanca - unexpected movement in a subject’s moral world. Moreover significant advances in knowledge and the ensuing ethical problems are the result of a long battle, as is captivatingly elucidated in the poetic formulation of the normative and instrumental mediations in the second entrance of the chorus in Sophcles’ Antigone. This issue of Aesthethika brings together original articles that contribute to this complex question. It opens with Juan Manuel García Haro’s study of guilt in Classical Greece, wherein he lucidly explores the categories of necessity and chance, from Aristotle and the pre-Socratics to modern understandings of freedom and responsibility. This is followed by, a key text written by Roberto Markarian, wherein he proposes lines of articulation between mathematics and psychology. A specialist on chaos theory, he returns to the talk he gave at the 2015 inaugural conference at the International Summer School, as Dean of the University of the Republic (UDELAR), Uruguay. Next is a preview of the Spanish edition of Julio Cabrera’s book Margins of Philosophies of Language, an essential literary work both for the debate that it introduces and for the methodology with which he approaches it. From Julio Cortázar’s Cronopios and Famas to the most relevant thinkers of the 20th century, the treatment of ideas fuses the rigor and poetry to which the author of Cinema: 100 years of philosophy, has accustomed us. We close this first section with an especially valuable and (as yet) unpublished piece by Ignacio Martín-Baró, which requires a brief comment. It is the transcription of his classes on professional ethics in psychology, delivered at the Universidad Centroamericana José Simeón Cañás up to the time of his tragic death at the hands of the Salvadoran army on November 16, 1989. Typewritten versions have circulated over the years, becoming part of academic courses at different Latin American universities. We have revised the text and enriched it with bibliographic references as one small contribution to the remembrance events of the 25th anniversary of the massacre of the Jesuits. It is published in accordance to the original specifications given by Martín-Baró with our gratitude to Mauricio Gaborit, SJ, and scholar of the UCA. This edition contains a multimedia section that includes the video version of Fabián Schejtman’s conference address on nodal ethics, given at the UBA, summer 2015, and reviews of two books: Destinies of testimony: Victim, author, silence, edited by Carlos Gutiérrez and Gervasio Noailles (Letra Viva, 2014), and the highly anticipated DVD, Ethics at schools in the hands of the Simpsons, coordinated by Elizabeth Ormart and Juan Jorge Michel Fariña. Last but not least, this issue of Aesthethika comes out on the 100th anniversary of the Armenian genocide, a subject about which the editors have commented on various occasions. The latent question in the reference to the tragic fate of Martín-Baró and on the anniversary of the Armenian massacre, is that underlying Escher’s engraving, that is, how does one give witness to horror?- What ethics is there vis-à-vis extermination? The review of Gutiérrez and Noailles’ book, which is deeply marked by the paradigm of Armenian testimony, and an updated version of Eduardo Laso’s classic on the film Ararat, are unavoidable references. This is our contribution in this crucial hour -our way of keeping the essential memory of these times alive.